I wrote this tribute for the funeral programme for Cynthia Osokogu at the behest of her friend and her mother who have never met me. It was the hardest thing I have ever written in my life and an honor. 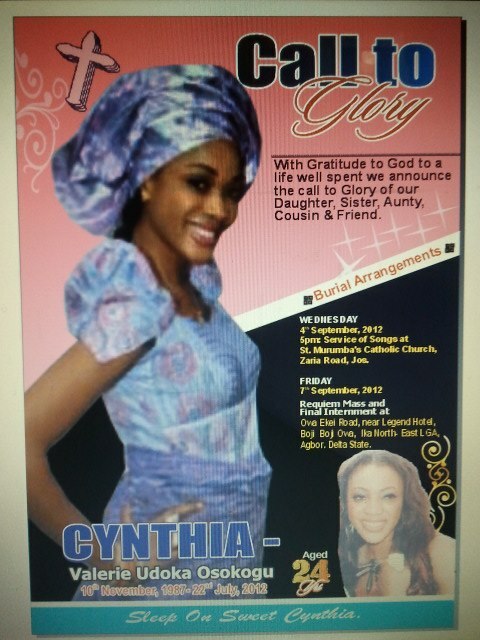 Below my tribute is a vote of thanks from Cynthia’s friend, Aishatu Ella an amazingly loyal friend. When I first saw Cynthia’s picture I thought; what a pretty girl. I looked again, saw the words saying she was missing my head started to hurt, and my imagination went berserk. I read each update about Cynthia from what I like to call, the corners of my consciousness, as if not confronting bad things can make them untrue. I was afraid for this girl, and I was afraid for her family. Somewhere in between the fear and the search and the finding Cynthia became the focal point for a national conversation with big words and loud voices. Nigerians were generally horrified and empathized, but some of these voices developed their own version of Cynthia. A version that deserved it. The way many young women are often told they particularly deserve the bad things that can and do happen to practically anyone in this place. Maybe, in trying to make sense of a senseless murder, it became necessary to cling to all the reasons why it happened to her, and will not happen to us. But we can’t distance ourselves from a terrible crime in a precarious country by holding up comfortable versions of Cynthia as our talisman. I was angry at the mean percentage as I like to call them, but failed to realize that just like me, they may deal with fear by distancing. I posted a link to a story after she died with a warning for people to be careful using facebook. Her friend pointed out the insensitivity of my posting and I argued, then apologized, took down the link, read what Aishatu, Cynthia’s friend had to say about her and promised to share it to as many people as possible. I still didn’t get it until I read what she wrote. I read Aishatu’s write up and I cried. I cried because Cynthia was humanized by her friends words. I finally saw her. I cried because I had reduced her to a cautionary tale on the safe use of facebook and I was ashamed. I cried because I saw her mother in those words. I cried because Cynthia the person got lost in the weight of our fears, prejudice, judgments and even our good intentions. I cried at the sheer waste of it all. I cried because I recognized her story. She was a young woman who wanted to be somebody. She had her first degree, was working on her master’s degree, was running a shop, had been selling clothes since age 19, had brothers, parents, friends, dreams… a life. A life taken so soon. I cried because in this country we all are Cynthia and we are too frightened or blind to see it. I never met Cynthia. I am honored her mother asked me to write a tribute for her baby. And yes that made me cry as well. I pray her family knows peace. Cynthia was a great girl and always will be. What do I say to God except Thank You? Thank You Lord for the opportunity of meeting and sharing time with one of the most beautiful people (in and out) in the world, Late Cynthia- Valerie Udoka Osokogu. I am very fortunate to have had a friend and Baby sister like Cynthia. I want to use this opportunity to say a Big thank You to Nuhu Fulani Kwajafa , Your care, love and support through all this and your quest for the truth, God bless you My Brother. I also say a big Thank you to Uncle Sola Kuti, who insisted I write about Cynthia and Clear the air, Thank You and May God Continue to increase you in wisdom and Honor, You shall be the head and Not the tail. Kayode Ogundamisi, What can I ever say or do to appreciate you? God who sees in secret will reward you Openly, Aunty Pamela Braide who in an amazing woman and worthy role model, God bless you, Soni Akonji, Anty Evelyn Onyilo , God will grant you all the desires of your heart. Uncle Emman Shehu, If not for you, hmmm, I am on my knees, praying for you every day, You kept the media positive, God bless The Nation Newspaper, who from day one never got carried away with sentiments. From day one you never humanized Cynthia; not worried about selling papers with half-truths but seeking the truth and showing Cynthia as a daughter, sister and friend. Mr. Yusuf Idegu of the Nation Newspaper Jos, I cant thank you enough, You are an amazing man. All of you my friends who sent messages, tributes and called, God Bless and reward you and Keep you from harm. To the people who read our tribute and sent me friends request, loads of them as i explained I am humbled by your gestures but I have been off facebook for a while and i just reactivated my account due to Cynthias disappearance and Death, it will be a diservice to accept you and disappear, Thank you for your understanding, prayers and Love. There are so many more people who I may not have personally mentioned but believe me, I am saying thank you. For Cynthia’s Killers, I pray for you that you find God and repentance even as you have the chance to defend yourselves in court. I pray for you, your families. Romans 12′ 15 “do not repay evil with evil but repay evil with good”, It is well, Vengeance is for God. To those people who started rumors and half truths and carried it on even in the face of glaring truth, I say God bless you and heal you of whatever deep pain that has turned you to hateful, judgmental people who will assume the worst of people you don’t know and refuse to see or accept the truth, May God heal your wounds, and open your eyes and heart to see love and good in the least of your brethren. The Nigerian Police Force, God Bless you, In my 20 + years as a Nigerian, never have i seen such efficiency and dedication. People say wrongly that it is because Cynthia was a Generals daughter but i remind them of high profile murder cases including that of a Chief Justice which 9 years on is still unsolved. Cynthia had a pure, innocent and gentle spirit that is the best explanation I can give in understanding the way everyone in one way or the other connected to her murder has been rounded up in record time. For my country Nigeria, I pray for peace and Justice, everyday families accross the county are mourning because their loved ones die from preventable and man made causes: Accidents on bad roads, fake tyres, fake drugs, insecurity, boko haram, armed robbery, so many families are still in tears searching for their loved ones for years not having closure of knowing if they are dead or alive. I pray for Nigeria, Lord Heal our Land. Please continue to pray for Her family, Daddy Frank, Mummy Rita, Kenneth, Tony, Williams and Oninye, a light has gone out of that family, No one can feel the loss and pain they feel, only God can heal them.